Your small contribution makes a big force for global environmental protection. Environmental Material: The body of the straw made of food-grade stainless steel, no metal aftertaste, plastic free, dishwasher safe, reusable and Eco - friendly. Portable Size: Perfect design with triple-jointed stainless steel, it can be easily folded and fit into a keychain-sized metal container, so you can get it whenever you need. Healthy Drinking: The straw's interior tube is exquisitely made of medical-grade TPE material, which ensures that every time drinking as safe as your daily eating food. Nice Length: The whole straw is about 23cm, it can perfectly sized to fit in a glass or in many other short cocktail glasses. 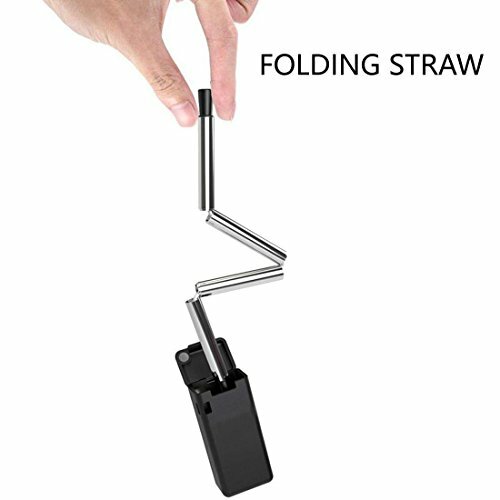 Widely Useage: It not use for a drink straw, also can use it for a coffee spoon, more environmental. If you have any questions about this product by Ushining, contact us by completing and submitting the form below. If you are looking for a specif part number, please include it with your message.